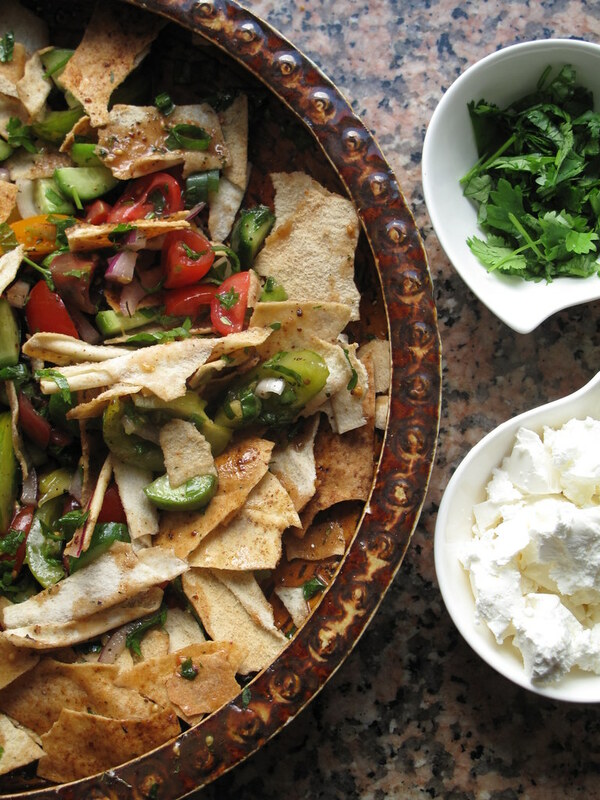 Embrace the heart of the Levant with Fattoush, of the genus Fattat – a family of stale bread salads with toasted or fried pieces of khubz ‘arabi ( pita bread) as the base, combined with seasonal vegetables. 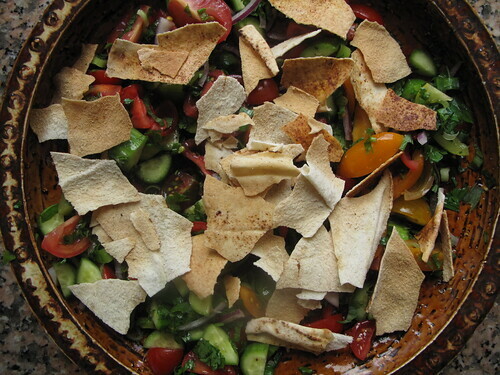 Like croutons, the crisp pita shards bring bready substance to the fragrant, herbed salad alongside heirloom tomatoes, cucumber and pungent onions, all laced with an edgy dressing of purple-red sumac, lemon juice and dried mint. If you’re thinking sour, sour, sour, relax…..all that zing zang of the citrus and sumac are tempered by sweet pomegranate molasses. I upped the amount of pom molasses…I’m sweet like that. What I ♥: the dressing lightly pickles the onions, sweetening and softening them a tad yet keeping their allium flavours intact. 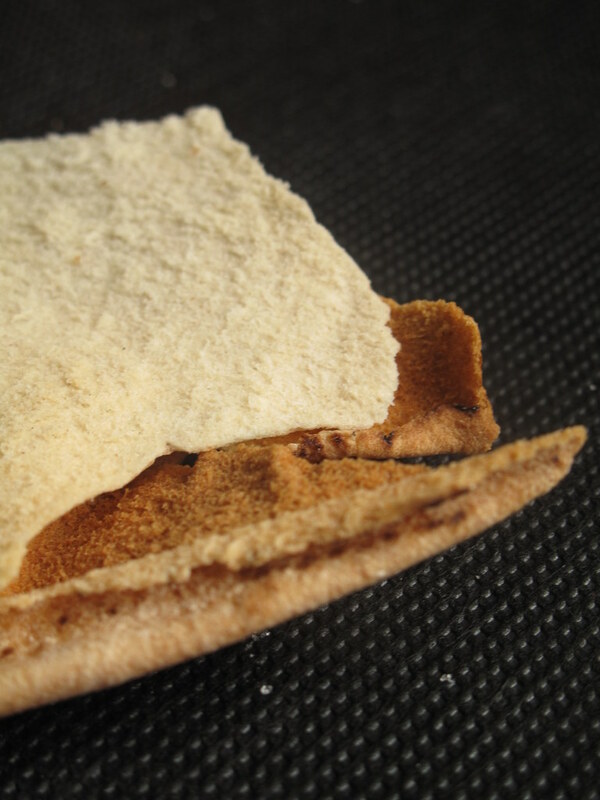 The pita crisps react by shedding some stiffness, softening too but still with character. Don’t skip the ‘dress, rest & bloom’ – you will be rewarded. Feeling fancy, like I was? 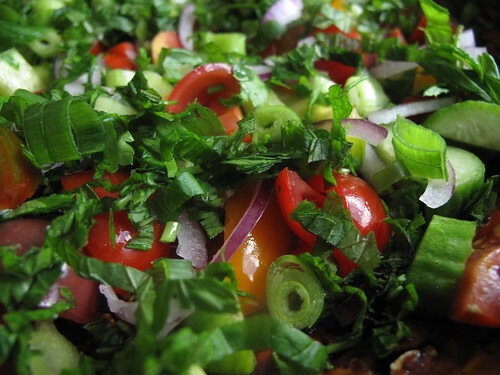 Crumble feta cheese over the top, add more kelly-green chopped coriander leaves and delicately place some black olive rings over the top. Just joking about being gentle with the olives, I didn’t have any to hand but I plan on next time. Make it. Today. Before the summer runs away. Whatever you do, make it. 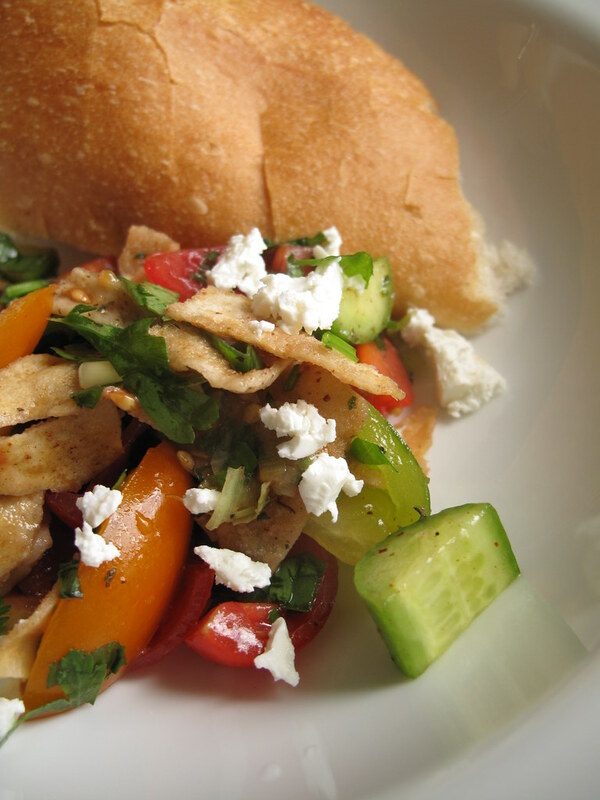 And enjoy one or many firsts like using the raved about heirloom tomatoes in a recipe, like making fattoush. Sorry, said that already. Like finally opening up the jar of sumac that I’ve had for months……..and never used! 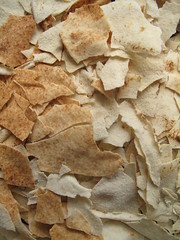 Preheat the oven to 180 deg C. Cut open the pita bread rounds and place them in a single layer on one or two baking sheets, which I place in the middle and on the rung up from the middle, invariably, the tray on top gets browner a lot faster than the middle….Miss Adventure loves the ‘burnt’ bits so that’s her tray and we others take the second one. 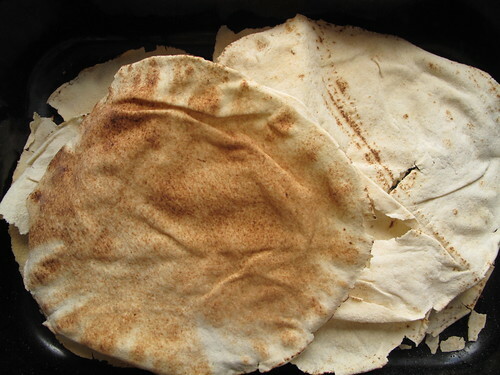 When I bake the pitas ahead, I plain bake them. 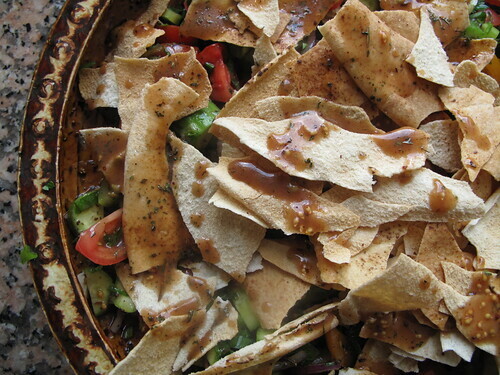 You could also drizzle them with a couple of tablespoons of olive oil, and a sprinkling of salt, pepper and sumac as Rivka suggests for tasty chips. Depending on how fast your oven goes, bake them for 10 – 15 minutes, until crisp ensuring you check often – its not far from crunchy to useless. 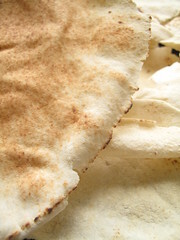 Break the pitas into uneven bite-sized pieces then set aside. 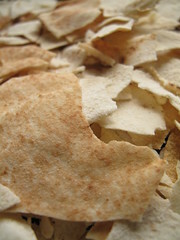 Add pita chips on top. 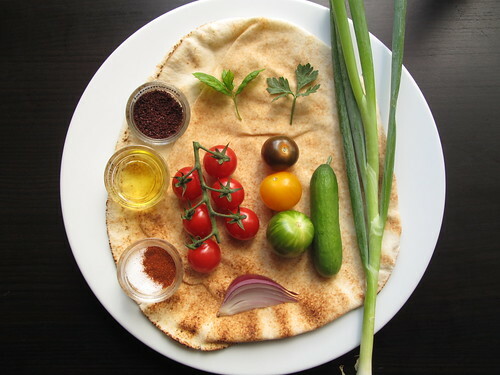 Make dressing: combine all ingredients except oil, and whisk to combine. Add oil in slow stream, whisking as you pour to emulsify dressing. 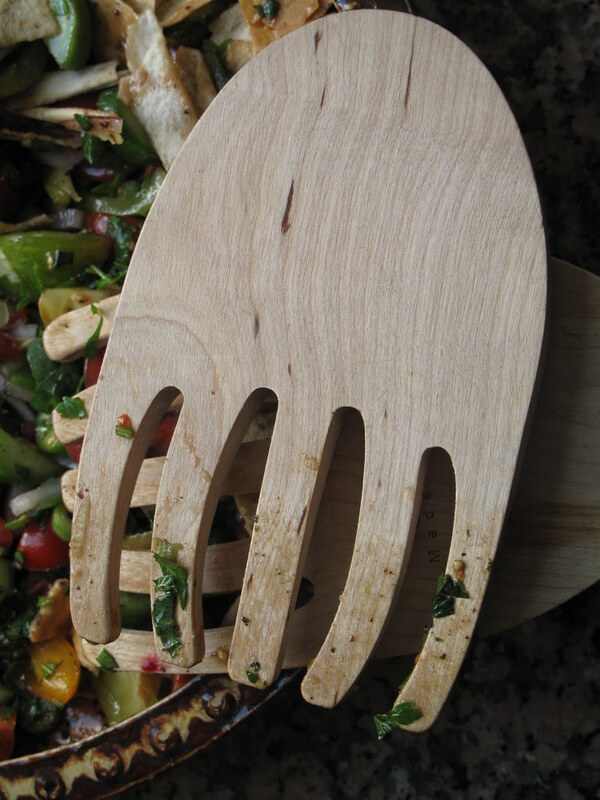 Drizzle dressing over salad, and let sit for 20-30 minutes before serving, tossing every 10 minutes or so to meld flavors. Have a great weekend and stay blessed. Thank you Rivka for getting me to take the plunge! 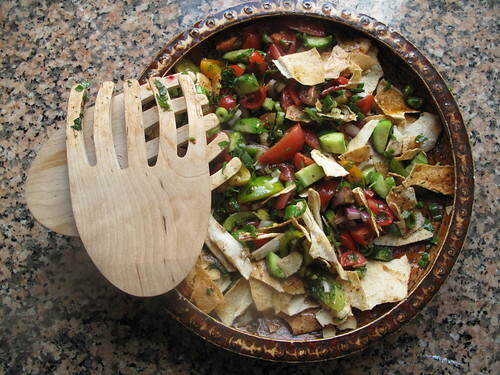 Do you like Fattoush? Any secret ingredients to throw in the mix :-)?